Ever since I made those Caramel-stuffed Snickerdoodles I’ve been on the hunt for another creative stuffed-cookie option. I loved the novelty of a surprise filling inside an already delicious cookie, and it wasn’t long before I came up with this idea. I am obsessed with those Newman’s Ginger Os (ginger cookies with vanilla cream filling,) so why not just stuff it inside? The combo of the two flavors together seemed like a wonderful holiday cookie idea don’t you think? I’m not gonna lie, these cookies are bit time consuming to make because you have to chill the dough after each step. But I promise you it is worth it. These were the perfect cookies to make on a cozy night in while watching Season 2 of Parenthood on Netflix. (Anyone else a fan?) While my dough chilled I caught up on the Braverman antics and paused while I popped the next batch in. When thinking about Christmas cookie ideas- this is a great one to add to the spread. Nothing is more festive than a soft and spicy Ginger cookie- but add a tangy cream cheese filling- and we have cookie bliss. Even without the filling- this is an amazing cookie: chewy, tons of spice, crackly top- perfect. If you don’t feel ambitious enough to add the filling, just make them as is- you’ll thank me when you start to smell the spicy goodness in your home. Enjoy! PS- Sorry I couldn’t take some photos of the process of assembling these cookies. My hands were way too full of cookie dough! *If you can't find the preserves, you can use chopped up crystalized ginger. In a small bowl, mix together the cream cheese, sugar and vanilla until smooth and creamy. Put in the fridge to chill. Next- whisk the flour, ginger, baking soda, cinnamon, allspice, salt and black pepper together in a medium bowl. Beat the butter and the sugars with a hand mixer electric mixer on medium-high until light and fluffy, about 2 minutes. Scrape down the sides of the bowl. Add the egg yolk and vanilla and beat on medium speed until just incorporated, about 20 seconds. Add the molasses and ginger preserves and continue beating until the batter is an even light brown color, 30 seconds more. Add the dry ingredients all at once, beating slowly to make a soft, smooth dough. Use a rubber spatula to make sure all ingredients are combined. Then beat again for 20 seconds. Cover the bowl with plastic and refrigerate the dough until firm, about 25 minutes. Bake until the top is crackly, and the insides peeking out through are dark and moist but not raw, about 15 minutes. Briefly cool the cookies on the baking sheets, then transfer to racks to cool completely. Serve or store in a tightly sealed container for up to 3 weeks. Lord, woman, your sole purpose in life must be to reduce me to a drooling puddle! This looks beyond delicious! I’m making these this weekend!! YUM!! Also, I made your pumpkin pie cupcakes for Thanksgiving last week and they were a hit!! Thank you Audra for all the great ideas!!! These sound amazing! I always get so excited when holidays roll around cause I love ginger and spice cookies! Why aren’t they year round?? :( I need to try these ASAP! Oh my holy cow yumminess!!! I seriously cannot wait to make these. I want to run home right now and make them, they look soooooooo darn good. These could very easily become a staple in my home. Thank you for sharing this recipe. On another note, I am totally hooked on Netflix, I haven’t seen Parenthood, but I’ll have to check it out. Happy Holidays! Ahhhh, you’re making my life so difficult! I had finally decided what cookie I wanted to bring to my family holiday party, but now there’s these and they have ginger and cream cheese and they look so good and I don’t know what to do! I love your stuffed cookies! & these look extra delicious for Christmas :). Can’t wait to make these! 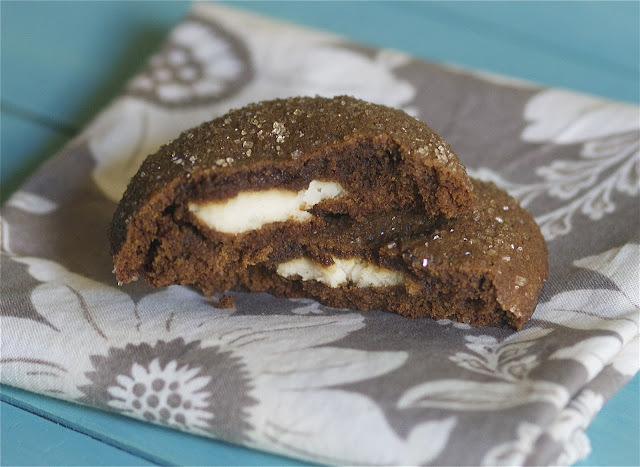 Who doesn’t like treats that are filled with cream cheese? I am going to have so many different cookies to make this season… these are just amazing! Filled cookies are sometimes so much better than sandwich cookies. These are a great combination of flavors and they look so delicious. The inside is a tasty surprise because you can’t tell they are filled. Great post Audra! these look fantastic Audra! I love ginger and cream cheese. I’ll have to keep this recipe for later, thanks for sharing darling. Aww man. These sound awesome! Oh yum! These sound wonderful! What a great idea! Oh boy. Stuffed with cream cheese? Sounds so good! I just baked soft gingerbread cookies with a lemon glaze for the first time and LOVED them. I may be forced to try these next. Love the spice flavor combination in ginger cookies.